Reader Kenna couldn’t understand it. The research target she was closing in on lived in Tennessee in the 1840s and, she was sure, should have been on a militia list she found. But his name wasn’t there. He’d been in the census in 1840, and a tax list around the same time… but not on that militia list. And it’s The Legal Genealogist‘s mantra that gives us the answer to why he’s not on that list. To understand the records, we have to understand the law. Not the law in general, but the law at the time and place where the record was created. 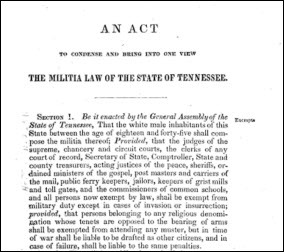 Tennessee passed a comprehensive statute on the 28th of January 1840, called “An Act to Condense and Bring into One View the Militia Law of the State of Tennessee.”1 And it tells us exactly who should — and who should not — have been on those 1840s era militia lists. You can see from this one section that there are a lot of people who are not going to be subject to militia service. Kenna needed to look at what her research subject did for a living. It turned out, looking at the 1850 census, that he was a Methodist Episcopal preacher… an ordained minister of the gospel, in the words of the statute. And, as a result, exempt from militia service. Always always always… look to the law of the time and the place. Catching up on my reading. This is again another excellent find on your blog. Thank you for teaching us.